Published: Oct. 6, 2016 at 07:03 p.m. Updated: Oct. 6, 2016 at 07:43 p.m. Here we'll look where cornerbacks and wide receivers line up, which defenses are particularly susceptible to which player packages and so much more in order to find value with our fantasy players. As the season goes along we'll have even more data to use and a better understanding of the Next Gen Stats. Here are the top matchups that could bring value in Week 5. It's hard to overstate just how well Isaiah Crowell has performed this year. Despite playing with a rocky carousel at the quarterback position and a passing offense that averages 6.0 net yards per attempt, Crowell is second in the NFL in rushing yards. Crowell has run well out of both the shotgun and traditional running back formations. He averages 5.8 yards per carry out of the shotgun and a whopping 11.3 out of the I-Formation, where he's taken the majority of his carries (37.7 percent). Crowell also has the shortest average distance traveled per rushing yard gained (2.86). What this shows is that Crowell is running straight ahead downhill with aggression. What's most incredible about Crowell's performance is that opponents know what's coming and they are game planning to stop him. Crowell has faced eight-plus defenders in the box on 45.9 percent of his 61 carries. Among running backs to faced stacked boxes most often, Crowell has been by far the most effective. He averages a whopping 8.0 yards per carry against defensive fronts with eight-plus defenders in the box, which is by far the highest figure in the NFL among the 10 backs who have faced stacked boxes most often. Even if you remove the 85-yard touchdown run against the Ravens in Week 2 that factors into that sample, he still averages 5.2 yards per carry on all of his other runs against stacked boxes, which would be second only to DeMarco Murray (6.6). Even more impressive is how Crowell is doing all this without a lick of support from the quarterback position in threatening the defense vertically. Cody Kessler threw just one pass beyond 15 yards in Week 4 and it was intercepted. 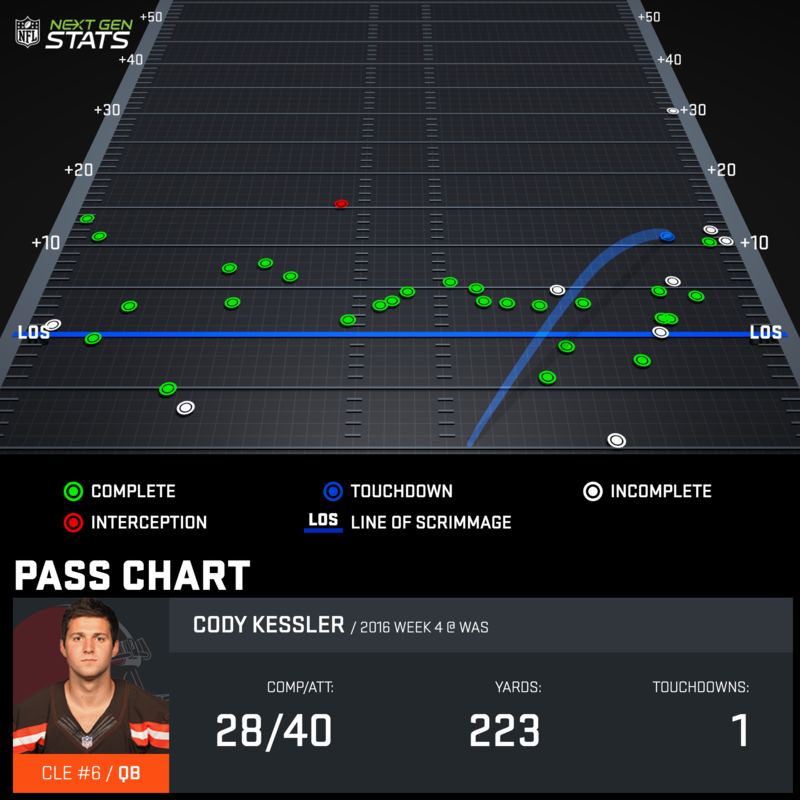 Kessler's passes average 5.68 air yards, the lowest in the NFL among quarterbacks to attempt 40 or more passes. Isaiah Crowell is the engine of the Browns offense and is a reborn new player under head coach Hue Jackson. Everyone knows it, but no one can stop it. Crowell is an every-week fantasy starter until proven otherwise. The Patriots, Cleveland's Week 5 opponent, has been solid but not devastating at stopping the run. New England allows 4.1 yards per carry to running backs and LeSean McCoy just stung them last week for 4.0 yards per carry out of the shotgun. Even though the Patriots game plan to stop what opposing teams do best, we've already seen that Crowell is more effective than any other back in the NFL when teams hone in on him. While Tom Brady and the Patriots will certainly look to thrash Cleveland in the quarterback's first game off suspension, Crowell has not been affected by game script thus far, as he registered 31 carries in the second half through four weeks. There's little reason to expect what has been a quietly dominant season for Crowell to slow down anytime soon. The minuscule usage of Alshon Jeffery through four weeks of the regular season might be the most confusing storyline in fantasy football right now. Jeffery averaged 10.4 targets per game and garnered over 30 percent of the team's market share when he played last season but averages a mere 6.25 targets per game in 2016. Jeffery has led the team in targets in just one game so far in what appears to be in an effort to prop up Kevin White as the top receiver by any means necessary. With White now on IR and Eddie Royal not practicing all week, there's at least some reason to believe Jeffery resumes a more dominant role in the offense as soon as this week. However, the way the Bears have deployed Jeffery indicates something might not be right injury-wise. The Bears have used Jeffery almost exclusively as a downfield receiver this season. Jeffery ranks first in the NFL in shortest average distance traveled per receiving yard gained (1.4 yards). There's a clear correlation to this metric with wide receivers who are primarily deep threats, with players like Will Fuller, Phillip Dorsett and Marvin Jones in the top five this year and Torrey Smith and J.J. Nelson among the league leaders last season. 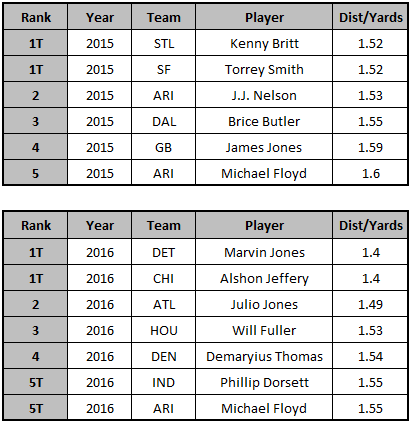 Of the top players in distance/yards for 2016, five of the seven are in the top-10 in yards per reception. Whether it is due to an injury or just a new development within the team's structure, Jeffery's use as a deep threat only would explain why his targets are down. Rarely do teams funnel consistent targets like Jeffery saw in 2015 to a pure downfield specialist, at least not conservative teams like the Bears. The question now is whether White's extended absence will open up volume for Jeffery. If he's indeed going to be funneled targets once again, he'll face a stiff test in Week 5. The Bears travel to Indianapolis and Jeffery will likely draw shadow coverage from the Colts' top corner, Vontae Davis. Now back from injury, Davis is looking a difference maker once again. In 66 coverage plays since he has returned Davis has been targeted 14 times and allowed just eight receptions for 70 yards. Jeffery still looks like a strong buy-low candidate, but his usage and deployment in this game will be critical in cracking the code to his outlook for the rest of the season. Much has been made of the All-World receiver's perceived slow start amid multiple heated emotional moments caught on camera. Avoiding trumped up storylines for the moment, Odell Beckham's on-field slow start is greatly exaggerated. Beckham has just two fewer catches and four fewer yards than he did in his first four games of 2015. The only difference is he had two touchdowns at this point last year and he's yet to score in 2016. Week 5 provides a pristine blow-up spot for Odell Beckham, much in the same way a "slow-start" season for Julio Jones massively reversed course last week against the Panthers. Top cornerback Sam Shields was already declared out for this game and fellow starter Damarious Randall has struggled the last two weeks against top wideouts. After limiting Allen Robinson to two receptions for 13 yards and a 39.5 passer rating on 13 coverage attempts, Randall got stung by Stefon Diggs (5-134-TD on 15 coverage attempts) and Marvin Jones (3-82-TD on 16 coverage attempts), allowing a perfect passer rating and catch rate to both in back-to-back weeks. Beckham can absolutely get right against the Packers in a game that should be high-scoring. The Giants already struggle to run the ball consistently, but Green Bay's defense forces teams to the air as they allow a league-low 2.0 yards per carry to running backs. Eli Manning hasn't been a prolific deep ball thrower his year posting a 70.2 rating on passes traveling 10-plus yards in the air, but much of that is because their top big-play threat in Beckham hasn't busted loose yet. This is the week for both to get right. No team bleeds vertical yardage through the air this year like the New York Jets. Their secondary has allowed 797 yards to the wide receiver position (fourth-most) through four weeks on just 66 targets. Big plays have been an issue for the Jets as receivers average 16.6 yards per reception against them. The Jets traveling to face the Steelers could not possibly be a worse matchup. 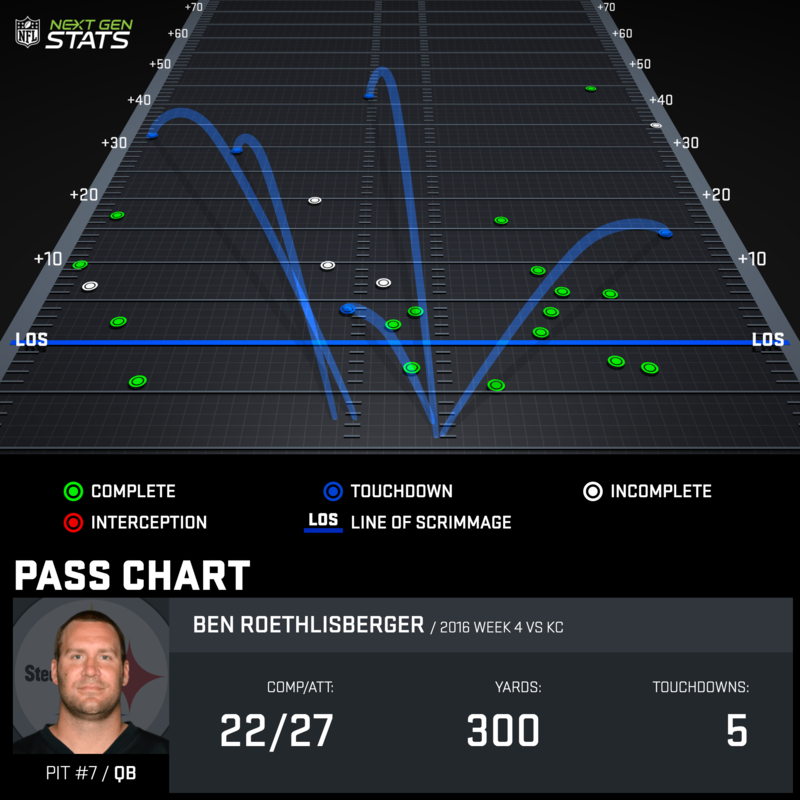 Roethlisberger led the NFL in air distance on his passes per reception in Week 4 with 23.14 and his passes traveled 10.42 yards in the air downfield. In Next Gen Stats' newest metric, Average Air Yards to Sticks which measure something similar to Football Outsiders' ALEX stat, Roethlisberger was far and away the top performer in Week 4. Roethlisberger posted a +2.9 average yards to sticks while the next highest quarterback was Matt Ryan with +0.8. With the Steelers so dialed in on the deep ball and the Jets secondary struggling to stop the vertical game, the flood gates could come open. Of course, we know that means plenty of stellar plays are on the way for Antonio Brown, but Sammie Coates could also have his best game of the season in Week 5. Coates played ahead of Markus Wheaton in Week 4, taking 57 percent of the team snaps to 36 percent for the latter. He also handled a career-high eight targets. Best of all, it was his most consistent outing to date from a route-running perspective. 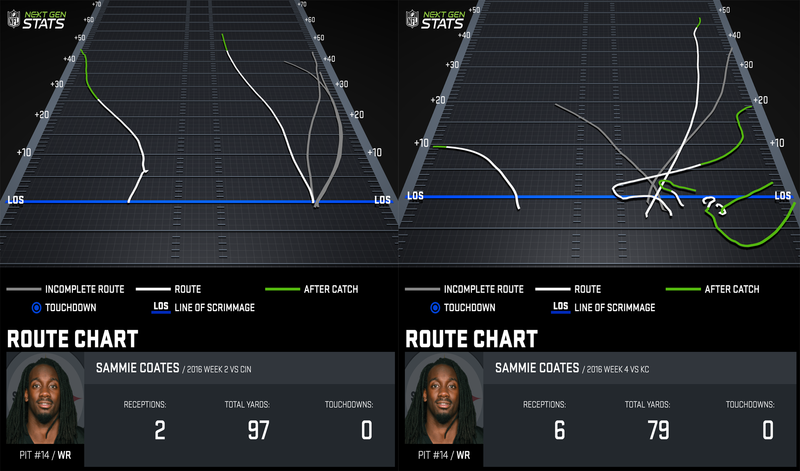 You can see the development of Coates' route chart from Week 2 to Week 4. In the first game he was just a shot player, and make no mistake, he's tremendous at that part of the game. Coates already has five catches of 40 yards or more this season. Coates' max speed on his 46-yard catch against Marcus Peters on Sunday night clocked in at 21.6 MPH, the fastest ball-carrier time of the week. However, Week 4 saw the Steelers assign him some more traditional routes, and bring his usage closer to the line of scrimmage. Much in the way the Steelers needed time to warm up to trusting Martavis Bryant, they have Coates on a slow-burning plan to his path as a full-time player. Week 5 could mark another point in his development against a secondary that struggles against his brand of wide receiver play. 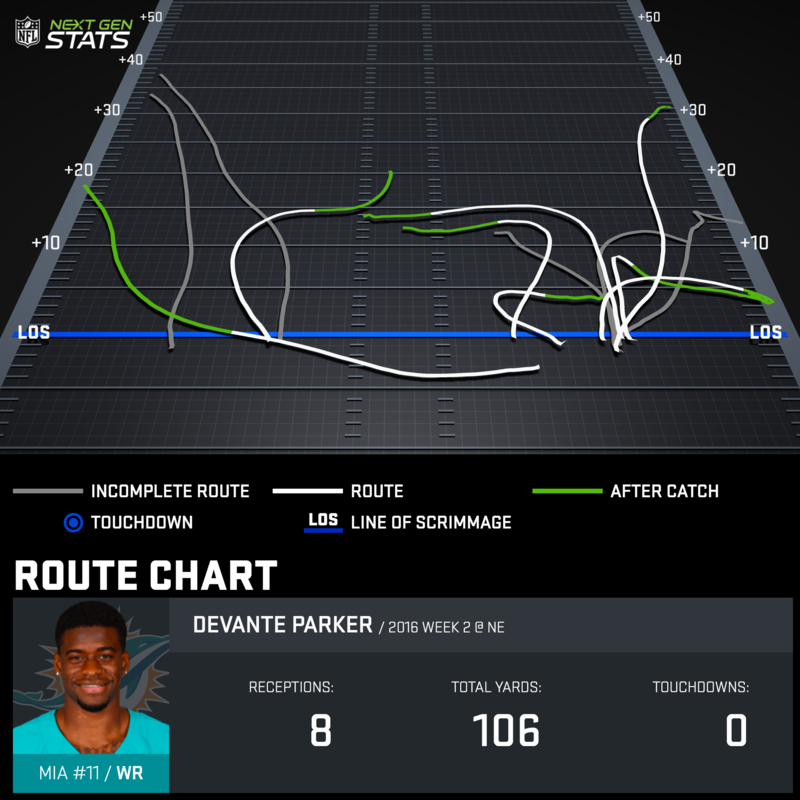 DeVante Parker went quiet with a 20-yard game last Thursday after posting 157 yards and two touchdowns combined in Weeks 2 and 3. The entire Dolphins offense sputtered against the Bengals but should get back on track as they welcome the Titans to Miami in Week 5. When Parker lines up at right wide receiver he will square off with burnable Titans corner Perish Cox. While Cox can make plays on the ball and has two interceptions this season, he can get beat, as well. Quarterbacks have targeted Cox on 25.8 percent of his coverage attempts and he's allowed 18 receptions for 228 yards and two touchdowns thus far. Parker is still an inconsistent player and has technical issues that make him less of a challenge for above-average cornerbacks to take out of the game, as we saw in Week 4 and in the second half of Week 3. However, Cox does not qualify for an above-average designation and Parker can certainly get over on him in Week 5. Through four weeks of the NFL season, there might not be a more burnable cornerback than the Ravens Shareece Wright. In 115 coverage attempts quarterbacks targeted Wright 29 times through four weeks. Wright has not found an answer in pass defense allowing 16 catches for 202 yards and a whopping five touchdowns. Quarterbacks have a 116.7 passer rating when targeting Wright this season. If Jackson draws Wright on more than a few plays, he can absolutely get over for big plays. Jackson is still one of the most dangerous deep threats in the NFL. 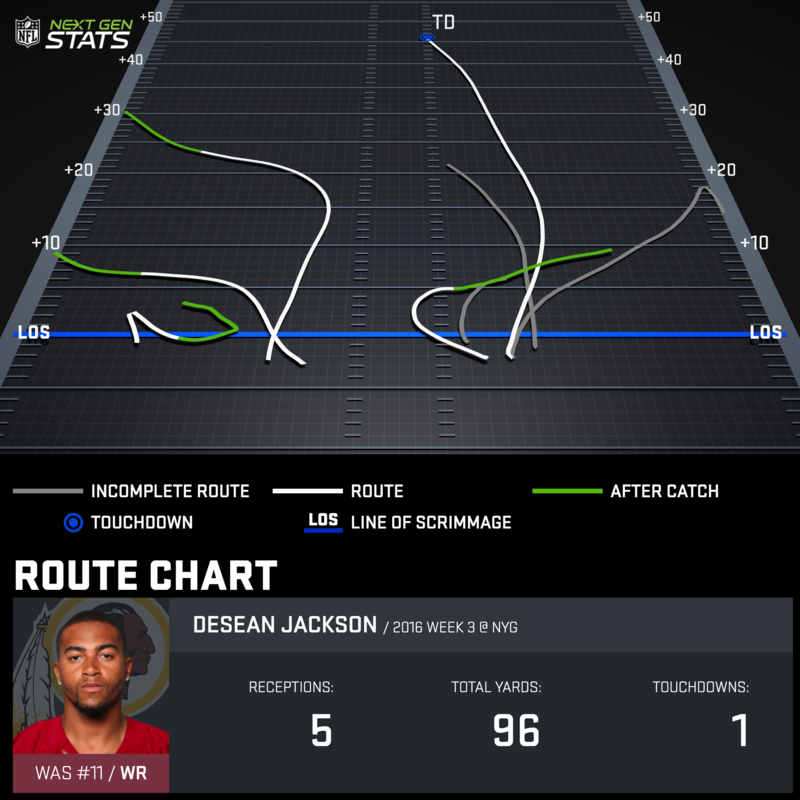 In Week 2 against the Cowboys, Jackson reached his top max speed of the season (22.46 MPH) on a deep incompletion from Kirk Cousins. On that play, Jackson earned 2.89 yards of separation on the go-route against Morris Claiborne. With tangible deep speed still in his arsenal and a matchup on deck against one of the NFL's most generous cornerbacks, this is setting up for one of Jackson's classic massive weeks. Washington should need to chase a Ravens team that projects to run the ball well against them in Baltimore. Don't be surprised if Jackson is in the top-10 scoring fantasy receivers this week. It's been yet another slow start to the season for Packers slot receiver Randall Cobb. Jordy Nelson's return to the lineup was supposed to free him up to play a more comfortable complementary role as he did in 2014 when he totaled 91 receptions for 1,287 yards and 12 touchdowns. Yet, Cobb's production from the slot is actually down on a per-game basis compared to what he did in 2015. Through four weeks he's averaged 3.3 targets, 1.7 catches and 24.3 yards from the slot this season, compared to 6.8, 4.1 and 46.2 in 2015. Of course, it's been a tough stretch for the Packers to start the season, as Cobb squared off with stellar rookie corner Jalen Ramsey in Week 1 and the team did battle with the Vikings vaunted defense in Minnesota in Week 2. The team as a whole got right in Week 3 against the Lions, but the volume still wasn't there in full for the pass-catchers. Nursing a 31-10 lead at halftime, Aaron Rodgers only threw 24 passes including a mere six in the second half. Over the last two weeks with Wade playing significant snaps the Giants have allowed 200 yards and a touchdown out of the slot to a combination of Stefon Diggs, Cordarrelle Paterson, Jamison Crowder, DeSean Jackson and Jordan Reed. Even if it's a limited Rodger-Cromartie and not the burnable Wade, the Giants coverage in the middle of the field is their weakest point in their new defense. Don't be surprised if we wake up Monday morning feeling much better about Randall Cobb's outlook after a solid game Sunday night.